Almost all women have some facial hair, whether it’s peach fuzz or a few coarser hairs that need to be kept under control. And most have some form of facial hair removal strategy – tweezers in a makeup bag, a tube of hair removal cream, or periodic visits to a salon for a quick wax. But if your facial hair is excessive, to the point where you can’t keep it under control or it causes you significant distress, you may need to consider a more effective solution. Excessive facial hair in women is called hirsutism, defined by the NHS as ‘excessive hair growth in certain areas of the body’. It is more common among women than men. Aside from being bothersome it can affect self-esteem, with those who suffer from it feeling consumed by the struggle to keep it at bay and maintain a ‘normal’ appearance. Hirsutism can be genetic, passed down from generation to generation, or it can be caused by hormonal imbalances related to the menopause or polycystic ovaries (PCO). Some women also have excess facial hair related to certain prescription medicines, or thyroid or adrenal gland issues, though the latter is less common. Women with unwanted facial hair should consult with their doctors before undergoing treatment. Tests may be necessary to determine the underlying cause, and there may be tablets which can help. At a certain stage, plucking, waxing and other simple forms of hair removal may not be enough. Aside from laser hair removal or electrolysis, there is the option of Vaniqa; available from Dr Fox. Provided they are suitable candidates for the treatment, women with unwanted facial hair can purchase prescription Vaniqa online and have it posted from a UK pharmacy. However, Vaniqa should not be used until an appropriate consultation with a doctor has been carried out. Is Vaniqa a depilatory cream? 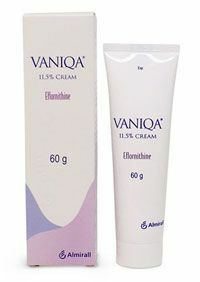 Instead of chemically dissolving hair like a hair removal cream, Vaniqa works by reducing new hair growth before it starts. Its active ingredient, eflornithine, penetrates the hair follicles and reduces new hair growth by affecting a key enzyme involved in the process. It can also be used alongside other hair removal methods, as well as prescription medicines for reducing hair growth, making it a powerful addition to an overall strategy for combatting facial hair. Vaniqa is appropriate for the top lip and around the chin. It is not recommended and is unlikely to be effective on other parts of the body. The cream is rubbed into the skin twice daily. Decreased hair growth may become apparent after about 8 weeks, though it can take up to 4 months. Reduction of hair growth will be maintained for the duration of treatment but the effects can be expected to wear off within about two months if treatment is stopped. Is Vaniqa available on the NHS? Vaniqa is not commonly prescribed by NHS doctors, and this is partially due to the cost of the treatment, though it is the only non-hormone cream for female facial hair licensed in the UK. It is available on the Dr Fox website at 25%-50% lower prices than other online clinics, with a discount available when purchasing multiple tubes. One 60mg tube will typically last for 2 months. Women interested in using the cream, and who have already consulted with a doctor about their facial hair, can receive a prescription from a Dr Fox physician after carrying out an online consultation. Posted on August 8, 2016 November 29, 2017 by Dr Tony Steele in Cosmetic treatments, Female facial hair.